A friend of mine travels 50 miles a day to a job she doesn’t like — she’s waiting for the day she can collect her pension and social security. This woman is an artist and a great home stager, yet she spends her days gritting her teeth at a job she can’t wait to leave. In my opinion, life is too short to spend time waiting for tomorrow. I left corporate America in 2008, to start a virtual trademark paralegal service. The first day I opened my “virtual doors” I thought my phone would ring off the hook. When it didn’t, I needed to find additional ways to make money. I remembered the term “multiple streams of income” and decided to put that concept into action. Multiple streams of income are ideal for anyone who has the talent, energy, and ideas to put them into action. When one profit center fails to generate the income you require, you can take the energy you were spending on that profit center and put it into the ones that are still working. Once you know how to develop multiple streams of income, the time you put into them is minimal. The advantage of having multiple streams of income is you don’t need to devote all your time and energy to each and every profit center. And it enables you to enjoy life and try new opportunities while income is still coming in from different avenues. One of my friends puts this principle nicely to work by having a part-time job at a fabric store, teaching sewing workshops, creating and selling beautiful jewelry and doing clothing alterations. The magazine business is a good example of how multiple streams of income work in traditional business. They sell magazines in stores and by subscription, they often sell subscriptions to online magazines, and they sell advertising space. If you believe the concept of multiple streams of income may be for you, there are many ways to decide on your profit centers. Start with an open mind and make a list of all the things you like to do. From that list, choose those that fit your interests and personality. You may have certain skills and training that will guide you in certain directions. From the remaining list, pick the top three that would bring you the most joy. Those are the profit centers you should begin with, adding more when you are able. Since you may not generate sufficient income at first, you will need to devise a plan to meet your expenses. The most obvious is to save as much money as you can before you start your profit centers. Also, a second income, such as a spouse’s income, a part time job, or a temporary assignment with an agency are additional options for you. It may take some time for the income to start flowing from your profit centers, but once it starts, it should continue. You will need to be focused and have patience during this time. Here are a few different income streams for you to consider. The possibilities are only limited by your imagination! Ideas in the area of services include babysitting, assisting elders, pet sitting, house sitting, house cleaning, snow removal, lawn mowing, a wake up service, a clipping service, typing resumes or papers for college students. Websites can make their money from more than one product or service. Also pay per lead or pay per clicks can be profitable — you will need to have a blog or website for this. As a Virtual Assistant, you can assist clients all over the world from your computer. You can sell your photos to a website. After you take the photo you can sell it as many times as you wish. You can also do this with DVD, eBooks or podcasts. Your photos can make money for you while you are sleeping. Investing in real estate requires money, however, the potential is great. You can purchase products to resell on an online Ebay store or on your own website. There are many options online to learn how to be a Website Designer — and you can earn a good income. If you are a writer, you can write for magazines, write a book, create text for a website, or teach writing classes. Retirement plans can benefit from multiple income streams. Great investments will continue to gather rewards for many years to come. It can be fun and profitable to research and buy stocks, especially those that have dividends. Start with inexpensive and safe investments and the returns become a profit center. Put your multiple income streams into a high interest account to make even more money. You can sell many things by mail order, such as recipes, booklets, kits, handmade jewelry. The sky’s the limit. Just get a post office box and a PayPal account, put an ad in a newspaper or on Craigslist, ship the merchandise, and wait for the money to appear. Some other ideas to consider are: entering online sweepstakes, raffles, contests, winning TV or radio call in prizes and using coupons. And don’t forget to go to the grocery store that gives you gas perks and/or food perks for shopping. Hopefully some of the above ideas will resonate with you and you can begin to earn multiple income streams too! Melodee lives in Dublin, Ohio, with her husband and two Siamese cats. She left corporate America in 2008, where she was an intellectual property paralegal. Since then she has devoted her time to writing and has had numerous articles published on a wide variety of topics. Her articles can be read on her website. That you for not saying “side hustle…” with all the negative connotations “hustle” brings with it. I read somewhere that the average millionaire has 7 sources of income. I think it’s a great, (and wise) idea to diversify your income as much as you can, instead of relying solely on one stream, because you never know when that might disappear! 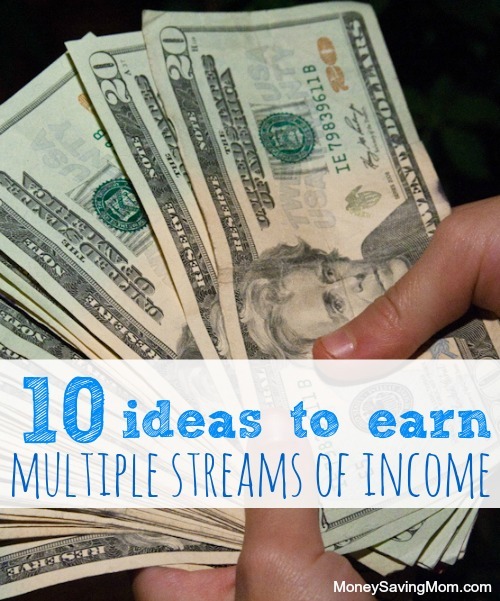 How many streams of income are you working with? And can you share with me what they ? I would like to start an income stream for myself and family. Do you have recommendations for how to become a virtual assistant? I love having all of these avenues to help others AND bring in some extra cash! But the best thing I do is empowering women (especially moms), to become successful business owners who not only raise their families, but increase their income by working at home! I look forward to reading about any other ways to create additional income streams! Unfortunately none of these options offers health insurance, the main reason I stay in my not very exciting job. More ideas include offering childcare, cleaning homes or businesses, or other manual labor that working people are too tired or busy to do themselves. Love this idea! Even if you start out with one idea and then gradually work up to multiple sources of income. It’s been motivating to me to spend extra time doing other work when I think it will go toward things like vacation or fun family activities. Can anyone expand on the selling stuff by mail order. Sounds interesting, but would love for someone to expand on details of how this works. Thanks. Love these tips! I am just starting out with my blog , taking baby steps. Between MoneySavingMom.com and You Book Money Making Mom that you sent me I am getting a ton of inspiration and having fun with it. I hope that one day my blog will take off. Thanks again Crystal for being one of my made inspiration for getting out there!